Only a few days back, Vishal’s Sandakozhi 2 was given the nod for a theatrical release on October 18 as a Ayudha Pooja holidays treat for fans. 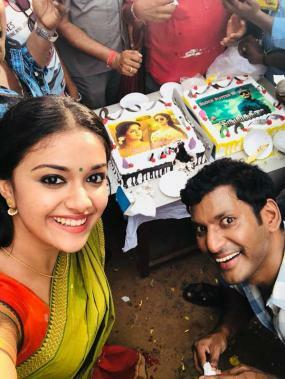 With actress Keerthy Suresh as the female lead, this Lingusamy directorial being produced under the Vishal Film Factory banner and music by Yuvan Shankar Raja has been progressing at a brisk pace. Along with actress Varalaxmi Sarathkumar in Sandakozhi 2, Vishal in a tweet on Twitter provided an update on the film’s present status saying production is nearing completion and that both Keerthy Suresh and Varalaxmi have strong characterisations. >>Viswasam: 'Thala' Fans Get Big Update! >>Kambathu Ponnu Video Song From Sandakozhi 2!